Some days, you just can’t stand how constrictive your work footwear is on your feet. You no longer have to deal with that in your life, thanks to these Florsheim FE2020 Men's Black Loedin ST EH SR Slip-On Oxfords. You may be wondering, “How will my feet stay pr ... (see full details) (see specifications) #FE2020. Some days, you just can’t stand how constrictive your work footwear is on your feet. You no longer have to deal with that in your life, thanks to these Florsheim FE2020 Men's Black Loedin ST EH SR Slip-On Oxfords. You may be wondering, “How will my feet stay protected in a pair of men's slip-on shoes rather than a pair of heavier work boots?” Leave it to us to explain. These men’s black work oxfords are capable of keeping you safe, as they're designed with steel toe caps that meet the requirements for the safety toe standard ASTM F2413-11 I/75 C/75. The standard is responsible for testing a protective toe’s ability to keep your toes from becoming harmed in the event of an accident. It does so by making sure the toe can withstand the force of drop impact as well as compression. Because the steel toe caps in these Florsheim shoes pass the requirements, you can get all of your work done without worrying that your toes will become flattened by a mishap on the job. In addition to being able to keep your toes safe, these men’s steel toe oxfords can keep your body safe. The outsoles are electrical hazard-resistant and meet the requirements for the safety standard in terms of resistance to conductivity. Basically, the soles are thickly insulated, which means they inhibit electric currents. While you're wearing these Loedin EH shoes, you'll be safe from electrocution when you come into contact with an electric current up to 600 volts in dry conditions. The steel toe caps and the electrical hazard protective outsoles give the black shoes an overall rating of ASTM F2413-11 I/75 C/75 EH. The great thing about the soles on these men’s safety toe oxfords is that they can protect you in more than one way. The outsoles are also slip-resistant, so they can prevent accidental slips and falls in front of your coworkers that could be quite painful, embarrassing, and pride-crushing. And because you're tired of having squished feet that weigh you down, these men’s slip-resistant oxfords are not built like boots. Sure, they can keep you safe like a pair of work boots can, but they're constructed like athletic footwear. They're lightweight for ease of movement. Plus, they feature a lace-up design, so they're easy to get in and out of before and after work. Working will never be the same while you're wearing these Florsheim FE2020 Men's Black Loedin ST EH SR Slip-On Oxfords. It will be better. 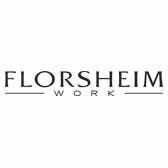 Order this Florsheim footwear here at Working Person’s Store today. Florsheim Shoes: FE2020 Men's Black Loedin ST EH SR Slip-On Oxfords is being added to your cart.